Day 301: Anothter one Bites the Dust . . . The mantra for Friday nights should be – a line from the Queen’s single – “another one bites the dust,” Think about it – another Friday = another week gone by. When the summer is as hot as it’s been the last few days, we wonder exactly who’s biting the dust? Seriously, with temps at 103 degrees today and a projected 105 degrees tomorrow, the lyrics of the song have taken on a whole new meaning! We know that summer is supposed to be hot. We know that we’ve been living in drought conditions for the past three years. We know that the more people that move to our part of the world, the more stress that will be put on the infrastructure. There was a time in the not too distant past when summer afternoons were filled with pop up thunder storms. You could set you watch to them, but they were scattered by nature! Yep, what we mean is that they were truly afternoon thunderstorms that popped up because of the heat of the day. Growing up in Houston, we could almost set a watch by them. . .but one never knew what side of town was going to get them. Be it northwest, west, southwest or wherever, the afternoon thunderstorm was an important part of what we remember growing up. So, tonight we decided that we needed something different, something that was going to mix well in the heat, but keep us from “biting the dust”! Yeah, the heat is on so the wine must be enjoyed to keep it from going ‘bad’ because there sure aren’t any afternoon thunderstorms on the horizon to cool things down. 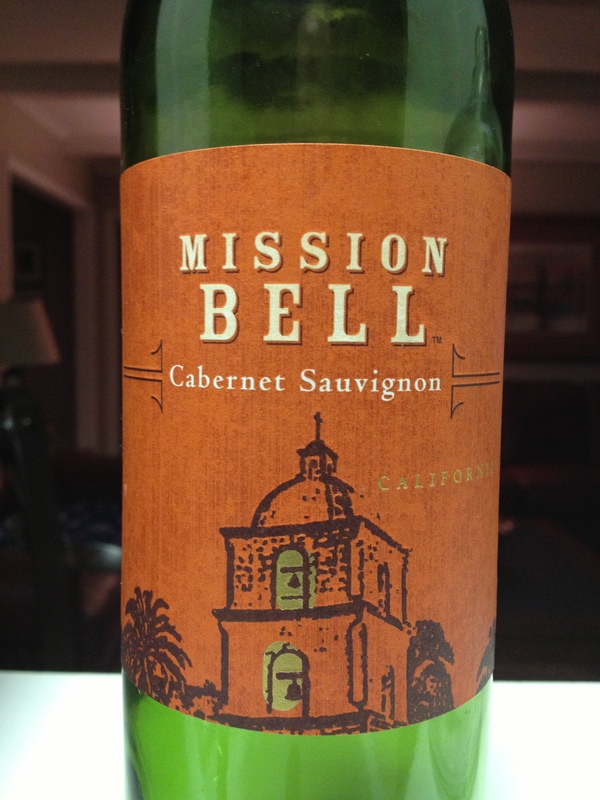 Our wine tonight is a 2011 Cabernet Sauvignon, Mission Bell. And, we stopped to think about songs with the words ‘mission’ and ‘bell’ and other key notes to catch our attention. . .from Matt Nathanson, Mission Bells, “I had a dream you died And I just wanna be with you tonight Mission bells were ringing!” Or, from Donnie Brooks, “My love is higher than a mission bell (how deep) Deeper than wishin’ well (how strong) Stronger than a magic spell.” And even Fleetwood Mac, covered the same lyrics. Clearly, enjoying Mission Bell Cabernet Sauvignon was in the cards tonight. With a fruity nose, we were anticipating a really nice, big, bold wine, but were disappointed to find a thin, weak and relatively boring wine. The bell didn’t ring for us as we tasted this wine. . .even with grilled salmon and sauteed vegetables, the wine couldn’t stand up to the food or the demands of a wine loving database. We’d hardly recommend this wine–even with its price under $10 a bottle. You can do WAY better for the money and for the varietal than Mission Bell, but it’s one of those things that will take time to build a wine collection/cabinet that is stocked with wines that YOU love! This wine shouldn’t be one of them. Plain and simple. You’ll enjoy too many others before you find the need to include Mission Bell. Congrats! We’ve made it through another week! As the weekend unfolds, continue to enjoy your favorite wine responsibly and remember to recycle whenever possible. Categories: Uncategorized | Tags: afternoon thunderstorm, donnie brooks, mission bells, summer afternoons | Permalink.